While regular physical exercise is key, it’s not the only way to keep the heart muscles in great working condition. Cardiovascular performance can also be improved by lounging in high heat. Here’s some information on the amazing benefits of sauna therapy. 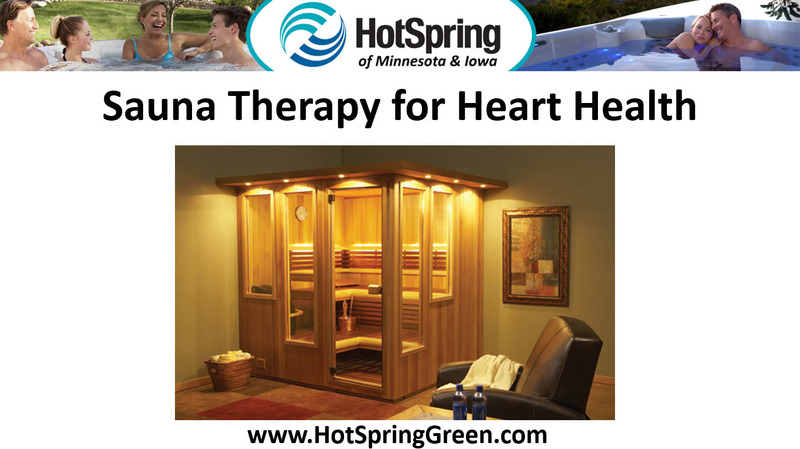 With regular use, the sauna gives the heart a mini workout, improving cardiac output. For maximum impact, sauna enthusiasts schedule short heat intervals, with cool off periods between sauna sessions. While you’re not likely to lose ten pounds overnight, with regular use, the sauna can make it easier to maintain a healthy weight. In time, as cardiovascular health improves, traditional exercise will have a more positive impact. A deep sweat in the sauna may also reduce risk of heart disease and stroke. By encouraging increased sweating, flushing waste and toxins out of the blood, the body does a better job of filtering out impurities. To encourage local residents to check out the benefits of using a sauna to help improve their overall health and well-being, Hot Spring Spas is providing free tests at all their showrooms. We do recommend, however, that people wanting to schedule their free 30-minute test call us ahead of time to reserve their spot. To learn more about the benefits of owning a sauna, pick up a copy of our free buyer’s guide, Sauna Buying Made Easy. Just give us a call at ☎ 515-270-8702 or visit our website at: https://hotspringgreen.com/.